Antisemitism in the United Kingdom signifies the hatred of and discrimination against British Jews. Since the arrival of Jews in the Kingdom of England following the Norman Conquest in 1066, Jews have been subjected to discrimination. The earliest Jewish settlement was recorded in about 1070. Jews living in England from about King Stephen's reign (reigned 1135–1154) experienced religious discrimination and it is thought that the blood libel which accused Jews of ritual murder originated in England, leading to massacres and increasing discrimination. One of the worst examples of early English antisemitism was the York pogrom at Clifford's Tower in 1190 which resulted in an estimated 150 Jews taking their own lives or being burned to death in the tower. The Jewish presence in England continued until King Edward I's Edict of Expulsion in 1290. Jews were allowed to live in the Domus Conversorum or house of the converted and low numbers are recorded doing that over subsequent centuries. 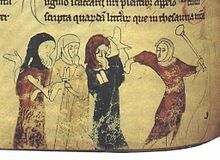 The earliest recorded images of antisemitism are found in the Royal tax records from 1233. In the late 19th and early 20th century, the number of Jews in Britain greatly increased due to the exodus of Jews from Russia, which resulted in a large community of Jews forming in the East End of London. Popular sentiment against immigration was used by the British Union of Fascists to incite hatred against Jews, leading to the Battle of Cable Street in 1936, at which the fascists were repulsed by Jews, Irish dock workers, Communists and anti-fascists who barricaded the streets. In the aftermath of the Holocaust, undisguised, racial hatred of Jews became unacceptable in British society. Outbursts of antisemitism emanating from far right groups continued, however, leading to the formation of the 43 Group led by Jewish ex-servicemen which broke up fascist meetings. Far-right antisemitism was motivated principally by racial hatred, rather than theological hatred which accused Jews of, for example, being responsible for the death of Christ. Throughout much of the 20th century, the almost sole source of antisemitism in the UK was the far right; however, according to a 2006 Parliamentary inquiry, it now stems from a broader variety of sources: the far right, Islamist antisemitism, Muslim-Jewish inter-community tension, and the political left. Although in the aftermath of the Holocaust far-right extremism became marginalised, Holocaust denial and antisemitic conspiracy theories remain a core element of far-right ideology. Meanwhile, criticism of Israel, especially from the left, has grown since the occupation of the West Bank and Gaza in the 1967 Six-Day War and intensified further following the second Palestinian Intifada and the invasion of Iraq in 2003; some witnesses to the 2006 Parliamentary inquiry spoke of a 'left-wing Antisemitism' which arises when these criticisms of Israel evolve into an attack on Jews as a group. According to Professor David Cesarani, antisemitism from the left has surpassed right-wing antisemitism; however, he says that he has found it hard to define and contest "because it no longer has any resemblance to Nazi-style Jew hatred, because it is masked by or blended inadvertently into anti-Zionism, and because it is often articulated in the language of human rights." Sociologist Dr. David Hirsh sees anti-Zionism as a political discourse that places anti-imperialism at the centre of an absolutist ideology that divides the world into two camps, a discourse that may take on antisemitic form, or merge with an antisemitic discourse, but might not in itself be consciously antisemitic. Some within the British Muslim community, particularly Islamist elements, are significant contributors to contemporary antisemitism. The underlying roots are complex and are a mixture of historic attitudes, domestic and political tensions, the Israeli-Palestinian conflict, and globalisation of the Middle East conflict. According to a University of Oslo report Muslim perpetrators are disproportionately represented in incident reports. Aggregated figures from Community Security Trust reports show that 45% of perpetrators are non-white, and according to a European Union Fundamental Rights Agency survey victims most often perceive perpetrators as "someone with a Muslim extremist view". The levels of antisemitic incidents in the UK often rise temporarily, in response to 'trigger events', often but not always related to Israel or the wider Middle East. Such trigger events are: the conflict in Gaza between Israel and Hamas and the terrorist shooting at the Ozar Hatorah Jewish school in Toulouse, France in 2012; the second Lebanon War in 2006; the Iraq War in 2003; the 9/11 terrorist attacks in 2001; and the outbreak of the Second Intifada in 2000. The Campaign Against Antisemitism (CAA) published a report in 2016 which said that police figures for antisemitic crime had reached a record level in 2015. The report stated that the level of antisemitic crime in 2014 had been the previous record, and in 2015 there had been a 26% increase in antisemitic crime year-on-year, a 51% increase in violent antisemitic crime, but a marginal reduction in charging by the police, which the CAA noted as "alarming" given the large increase in antisemitic crime during the same period and was very critical of the police. A year prior to the CAA report, the Community Security Trust published a report that indicated a significant increase in antisemitic incidents during 2014 in the United Kingdom. The report said that the number of antisemitic incidents more than doubled in 2014 compared to the previous year, reaching 1,168 hate crimes. Antisemitic reactions in Britain to the conflict in Israel and the Gaza Strip was named by CST as the largest contributing factor, with the highest-ever monthly total of 314 antisemitic incidents recorded in July 2014 (the same month as the operation protective edge). Despite these findings, research published in June 2015 by the Pew Research Center showed that of six countries participating, the population of the UK had almost the most favourable views of Jews. While 78% of Europeans have a favourable opinion of Jewish people (13% did not however), in the UK 83% of the population hold positive views, and only 7% hold unfavourable opinions of them. This can be contrasted with Muslims (81% favourable) and Roma (63%). In December 2014, the UK Department of Communities and Local Government published a report that describes the government action on antisemitism. According to this report, there is a 25% increase in the number of antisemitic incidents occurring on social media. That stands in reverse to the fact that during 2013–2014 there was a decline in the whole number of antisemitic incidents in the country compared to 2013–2012. The report also reveals that the majority of reports of antisemitic hate crime are focused in three police force areas: Metropolitan, Greater Manchester and Hertfordshire, where the overwhelming majority of Jews live. In July 2015 the Community Security Trust published an antisemitic incidents report for the first six months of the year. The report showed an increase of 53% compared with the previous year's results, with 473 incidents across the UK. Most of the incidents (353) were under the category of "abusive behaviour". There were significant increases in the violent categories ("violent assault" and "extreme violence") with 44 incidents, which was double the number for the previous year. In 36% of the total number of incidents there was a political reference: 32 incidents referred to Israel and Zionism, 16 incidents mentioned Islam and 122 incidents included far-right discourse. In 2017 the Institute for Jewish Policy Research conducted what it called "the largest and most detailed survey of attitudes towards Jews and Israel ever conducted in Great Britain." The survey found that the levels of anti-Semitism in Great Britain were among the lowest in the world, with 2.4% expressing multiple anti-Semitic attitudes, and about 70% having a favourable opinion of Jews. However, only 17% had a favourable opinion of Israel, with 33% holding an unfavourable view. The media reported that in an August 2017 YouGov survey of 2,025 British Jews, 83% of respondents thought the Labour party was too tolerant of antisemitism whereas 19% thought the same of the Conservative party; the study's authors noted that since Labour voters "are less likely to be anti-Semitic than other voters, so the cause of British Jews' discontentment with the party must be the way that it has very publicly failed to robustly deal with the anti-Semites in its ranks." 36% felt anti-Semitism was tolerated in the Liberal Democrats, while 41% said the same for the UK Independence Party (UKIP) and 40% for the Green Party. However, the survey suggests that antisemitism has been in decline over the past three years, dropping to 36% in 2017. According to Stephen Daisley, the Labour Party has, in the past, quickly taken a stance against groups where racism, sexism, and homophobia had been tolerated. However, in his opinion, anti-Semitism is now routine within the party, and that by its own definition, the party is now "institutionally anti-Semitic". It has been suggested by Len McCluskey, a member of the party for 47 years, that accusations of antisemitism in the Labour party are part of a campaign to discredit Jeremy Corbyn. McCluskey saying "Unfortunately at the time there were lots of people playing games, everybody wanted to create this image that Jeremy Corbyn's leadership had become misogynist, had become racist, had become anti-Semitic and it was wrong." Some in the Labour party (including Jewish members) have suggested that the Labour party is being singled out for criticism, and that Labour's policies still align better with Jewish values. During the 2017 Labour party conference, new rules were introduced to combat antisemitism within the party: in response, some party activists made the accusation that Labour were policing "thought crime". Georgina Lee cited Jeremy Corbyn's claim that none of the major political parties (apart from Labour) explicitly ban racism within their ranks, although UKIP banned "posting expressing racist, homophobic, xenophobic or otherwise discriminatory views [online]." Deputy leader Tom Watson, promised there would be an investigation on how the party provided a platform at a conference fringe event to Miko Peled, who stated that people ought to be allowed to question whether the Holocaust happened. Watson in response said, "It is nothing to do with the official Labour party conference. And, if there was Holocaust denial there, these people have no right to be in the Labour party and, if they are, they should be expelled." Peled responded to the accusations by saying that Watson and Ashworth were confusing freedom of speech with antisemitism, tweeting "free speech is now antisemitism too." Peled said he did not deny the Holocaust. Delegates at the event also made the demand that the Jewish Labour Movement be expelled from the party over their support for the state of Israel. In early 2018, a "self-proclaimed Nazi" was found guilty of stirring antisemitism in the UK following speeches before a group called North West Infidels in Blackpool and at a meeting of Yorkshire nationalists, which was attended by people from a variety of far-right groups. Francis Beckett claimed that attacks on Ed Miliband and his father, the academic Ralph Miliband, were tainted with antisemitism. Beckett concluded that "we have been conned into believing that anti-Semitism is now a disease of the left. In reality, it is still found mostly in racism’s historic home: on the right." Michael Fallon's article in 2015 about Ed Miliband using the phrase "A stab in the back" led to Fallon being accused of antisemitism. In 2017, an article in the UK's Sunday Times was deleted following an outcry alleging that its suggestion that two women were paid more because they were Jewish was anti-Semitic; the author, Kevin Myers, had previously been criticized for an article in which he denied the Holocaust. In 2016 the Liberal Democrat party suspended former Conservative MP Matthew Gordon Banks who had tweeted "Farron’s leadership campaign was organised and funded by London Jews" and "I tried to work with them. Very difficult"; the tweets were criticised as antisemitic. According to the 2006 Report of the All-Party Parliamentary Inquiry into Antisemitism, "Antisemitic discourse is, by its nature, harder to identify and define than a physical attack on a person or place." It is not normally targeted at an identifiable victim, but at Jews as a group. It influences and reflects hostile attitudes to Jews and Jewish-related issues, and can fuel antisemitic incidents against Jews and Jewish institutions. It may be found in the media or in more private social interaction and often reflects some of the features of old antisemitism, playing on Jewish stereotypes and myths, and seldom uses expression of contemporary antisemitism. Holocaust Denial and Holocaust-related Abuse – In certain circumstances the discourse of Holocaust denial may be used in a way that amounts to incitement to racial hatred. However, the act of denying the Holocaust is not a criminal offence as in other European countries. Conspiracy Theories – Those theories have been applied to many contemporary issues, accusing Jews and Israel indiscriminately of responsibility for all manner of world disasters. Dual Loyalty – Since the creation of the State of Israel, there have often been questions raised by the far-right as to Jews' loyalties to Britain. The Blood Libel – There has been a revival of the medieval "blood libel" against the Jews in some Islamist material in the UK. dehumanizing or demonizing Jews and propagating the myth of their sinister omnipotence; accusing Jews of double loyalties as a means to suggest their national belonging is of lesser worth; denying the Jewish people’s right to self-determination; blaming through conflation all Jews for the policies of the Israeli government; pursuing the systematic “Nazification” of Israel; turning Zionism into a synonym of racism. There is a history of antisemitic abuse directed at Tottenham Hotspur football fans. The football club has been associated with the Jewish community in London throughout most of its history and many of their fans are self-described as the 'Yid Army'. For this reason many opposing football fans have repeatedly directed antisemitic abuse at Tottenham fans at matches, in the areas outside the stadia and online. The Campaign Against Antisemitism published a survey in 2015 which found that 45% of British Jews feared they may have no future in Britain, 77% of British Jews had witnessed antisemitism disguised as a political comment about Israel, and 25% of British Jews had considered leaving Britain in the last two years because of antisemitism. In March 2019, it was reported that 534 of Britain's almost 300,000 Jews emigrated to Israel in 2018, representing the third consecutive annual decline. The figure was one third down on 2015 and was the lowest for five years. In 2016, the Home Affairs Select Committee held an inquiry into antisemitism in the UK. The inquiry called David Cameron, Jeremy Corbyn, Tim Farron, Angus Robertson and others to give evidence. Its report was critical of the Conservative Party, the Labour Party, the Chakrabarti Inquiry, the Liberal Democrats, the National Union of Students (particularly its then president Malia Bouattia), Twitter and police forces for variously exacerbating or failing to address antisemitism. The report endorsed various recommendations including the formal adoption by the UK government, with additional caveats (for example, on free speech), of the International Holocaust Remembrance Alliance Working Definition of Antisemitism. The report provided evidence of allegations of antisemitism in the Conservative Party including an alleged "toxic environment" in the UCL Conservative Society. The report found that Jeremy Corbyn had shown a "lack of consistent leadership", which "has created what some have referred to as a 'safe space' for those with vile attitudes towards Jewish people." The Select Committee found Ken Livingstone's claims that Adolf Hitler "supported Zionism" unhelpful to the Labour Party, while they found Shami Chakrabarti's report into antisemitism in the Labour Party to be somewhat lacking in a clear definition of antisemitism. The report concluded that "...there exists no reliable, empirical evidence to support the notion that there is a higher prevalence of antisemitic attitudes within the Labour Party than any other political party." The report also found that "The failure of the Labour Party to deal consistently and effectively with anti-Semitic incidents in recent years risks lending force to allegations that elements of the Labour movement are institutionally anti-Semitic." It found that, although the overt threat that the far right posed to Jews was no longer as great as it once was, nevertheless "Holocaust denial and Jewish conspiracy theories remain core elements of far-right ideology", going on to say that the British National Party (BNP) continues to stir up trouble and is damaging to societal cohesion. ^ a b Schoenberg, Shira. "United Kingdom Virtual Jewish History Tour." Jewish Virtual Library. 26 July 2017. ^ Cardaun 2015, p. 37. ^ a b c d e "ENGLAND - JewishEncyclopedia.com". www.jewishencyclopedia.com. Retrieved 17 October 2016. ^ "BBC - Religions - Judaism: York pogrom, 1190". bbc.co.uk. ^ "BBC - Religions - Judaism: Readmission of Jews to Britain in 1656". Retrieved 17 October 2016. ^ Lipton, Sara (6 June 2016). "The First Anti-Jewish Caricature?". New York Review of Books. Retrieved 30 November 2017. ^ Filby 2005, p. 56. ^ Nachmani 2017, p. 88. ^ a b c "Report of the All-Party Parliamentary Inquiry into Antisemitism" (PDF). All-Party Parliamentary Group against Antisemitism. Archived from the original (PDF) on 22 August 2013. Retrieved 18 May 2013. ^ Sicher, Efraim (2011). "The Image of Israel and Postcolonial Discourse in the Early 21st Century: A View from Britain". Israel Studies. 16: 1. doi:10.2979/ISR.2011.16.1.1. ^ Gunther, Jikeli. "Antisemitism Among Young Muslims in London" (PDF). International Study Group Education and Research on Antisemitism Colloquium I: Aspects of Antisemitism in the UK. ^ Enstad, Johannes Due. "Antisemitic Violence in Europe, 2005-2015. Exposure and Perpetrators in France, UK, Germany, Sweden, Denmark and Russia." (2017). ^ a b "ANTISEMITIC INCIDENTS REPORT 2006" (PDF). Community Security Trust. Retrieved 18 May 2013. ^ a b c "ANTISEMITIC INCIDENTS REPORT 2012" (PDF). Community Security Trust. ^ It should be noted that despite improvements in reporting, it is to be expected that antisemitic hate crime and hate incidents are significantly under-reported. This is particularly the case where the victims are minors; where the incident is considered of 'lesser' impact by the victim; and for incidents that take place on social media. Hence the statistics should be taken as being indicative of general trends, rather than absolute measures of the number of incidents that actually took place in the UK. ^ Boyd, Jonathan; Staetsky, Daniel. "Could it happen here? What existing data tell us about contemporary antisemitism in the UK". Institute for Jewish Polict Research. Retrieved 24 February 2016. ^ "National Antisemitic Crime Audit". 1 May 2016. Retrieved 23 July 2016. ^ "Police data says antisemitic crime rose 25.7% and violence surged 50.8% in 2015". 1 May 2016. Retrieved 23 July 2016. ^ "Report Says Number of Anti-Semitic Incidents in UK Doubles in 2014". Sputnik. Community Security Trust. 5 February 2015. Retrieved 30 April 2015. ^ "www.gov.uk/government/uploads/system/uploads/attachment_data/file/390904/Government_Action_on_Antisemitism_final_24_Dec.pdf" (PDF). GOV.UK. Department for Communities and Local Government Britain. Retrieved 17 January 2015. ^ "Antisemitic incidents: Januar-June 2015" (PDF). Community Security Trust. Retrieved 30 July 2015. ^ Bodkin, Henry (20 August 2017). "Labour 'too tolerant' of anti-Semitism - new poll". The Telegraph. Retrieved 26 November 2017. ^ Cowburn, Ashley (19 August 2017). "Over 80 per cent of British Jews believe Labour is too tolerant of anti-Semitism within its ranks, poll finds". The Independent. Retrieved 26 November 2017. ^ "Most UK Jews think Labour is too tolerant of anti-Semitism, YouGov poll finds". timesofisrael.com. ^ "McCluskey: No anti-Semitism in Labour". 26 September 2017 – via www.bbc.co.uk. ^ "5 reasons why some UK Jews support Labour, despite antisemitism charges". jpost.com. ^ "FactCheck: Labour and antisemitism". channel4.com. ^ At a later meeting at University College London in November 2017, Peled complained about a "witch-hunt against antisemites and Holocaust deniers" and said Corbyn had "put away" the "nonsense" about those issues. See Thomas, Alastair (12 November 2017). "Miko Peled: Zionists do not deserve a platform". The Jewish Chronicle. Retrieved 12 November 2017. ^ "Self-proclaimed Nazi found guilty of stirring antisemitism in UK". ^ "Anti-Semitism is a right-wing problem". www.newstatesman.com. ^ "Is the stab in the back attack on Ed Miliband anti-Semitic?". www.newstatesman.com. ^ "UK's Sunday Times deletes 'anti-Semitic' article after backlash". ^ "House of Commons - Antisemitism in the UK - Home Affairs Committee". www.publications.parliament.uk. Retrieved 22 June 2017. ^ "Lib Dems suspend former Tory MP over antisemitic rant". The Jewish Chronicle. 25 September 2016. Retrieved 15 October 2017. ^ "Attitudes Toward Jews, Israel and the Palestinian-Israeli Conflict in Ten European Countries – April 2004" (PDF). ADL. Retrieved 25 May 2013. ^ "Attitudes Toward Jews in Twelve European Countries – May 205" (PDF). ADL. Retrieved 25 May 2013. ^ "Attitudes Toward Jews and the Middle East in Six European Countries – July 2007" (PDF). ADL. Retrieved 25 May 2013. ^ "Attitudes Toward Jews in Seven European Countries – February 2009" (PDF). ADL. Retrieved 25 May 2013. ^ "Attitudes Toward Jews in Ten European Countries – March 2012" (PDF). ADL. Retrieved 25 May 2013. ^ "All-Party Inquiry into Antisemitism: Government Response - One year on Progress Report." GOV.UK. 12 May 2008. 29 January 2015. ^ "Antisemitic Discourse in Britain in 2009" (PDF). Community Security Trust. Retrieved 25 May 2013. ^ "Antisemitic Discourse in Britain in 2011" (PDF). Community Security Trust. Retrieved 25 May 2013. ^ "Sick fans greet Spurs title collapse with vile anti-Semitic abuse". standard.co.uk. ^ "Antisemitism Barometer". Campaign Against Antisemitism. 11 July 2016. Retrieved 17 October 2016. ^ Rocker, Simon (19 March 2019). "Aliyah from Britain falls for third year in a row". The Jewish Chronicle. ^ "Aliyah from UK close to lowest level as just 534 made the move in 2018". Jewish News. 20 March 2019. ^ ITV (16 October 2016). "Labour accused of 'incompetence' in dealing with anti-Semitism allegations". ITV. Retrieved 30 November 2017. Cardaun, Sarah K. (2015). Countering Contemporary Antisemitism in Britain. BRILL. p. 37. ISBN 978-9004300880. Daisley, Stephan (5 April 2017). "The Labour party has become institutionally anti-Semitic". The Spectator. Retrieved 25 November 2017. Donaldson, Kitty (27 September 2017). "New Anti-Semitism Scandal Prompts U.K. Labour to Tighten Rules". Bloomberg. Retrieved 25 November 2017. Elgot, Jessica (26 September 2017). "Labour to adopt new antisemitism rules after conference row". The Guardian. Retrieved 25 November 2017. Filby, Liza (2005). "Religion and Belief". In Thane, Pat (ed.). Unequal Britain: Equalities in Britain Since 1945. Bloomsbury. p. 56. ISBN 978-1847062987. Nachmani, Amikam (2017). Haunted Presents: Europeans, Muslim Immigrants and the Onus of European-Jewish Histories. Oxford University Press. p. 88. ISBN 978-1784993078. Weaver, Matthew; Elgot, Jessica (26 September 2017). "Labour fringe speaker's Holocaust remarks spark new antisemitism row". The Guardian. Retrieved 25 November 2017.